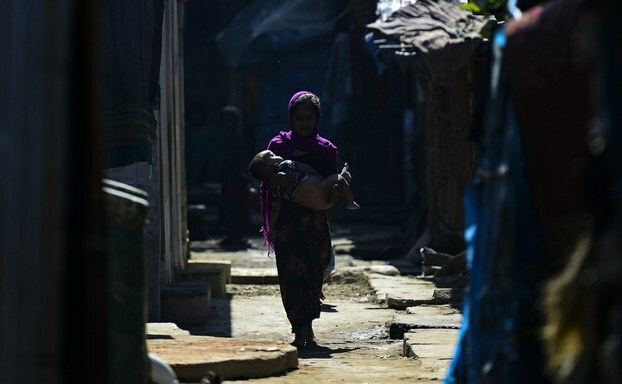 Dhaka -- A Bangladeshi minister who oversees humanitarian relief efforts expressed sadness upon learning of allegations that one in three Rohingya women interviewed at refugee camps had reported being raped by Myanmar security forces before fleeing to Bangladesh. Minister of Disaster Management Mofazzel Hossain Chowdhury Maya said that he and other officials had no direct knowledge of such abuses, but assured that he would look into these claims. “If it has happened, then it is really pathetic and inhuman. But we are not aware about this condition/experience of Rohingya women,” the minister told BenarNews on Tuesday. In an article published last week by BenarNews, 17 of 54 recently arrived Rohingya women who were interviewed by a correspondent at refugee camps in southeastern Bangladesh, reported that Myanmar security personnel had raped them during a military crackdown in Myanmar’s Rakhine state. Widespread allegations have emerged since the crackdown began in early October that Myanmar government forces have sexually assaulted Rohingya woman and carried out targeted killings and other atrocities against members of the country’s stateless Muslim minority. The BenarNews report marked the first time that specific numbers of rapes were cited based on random surveys of refugees. The government in Naypyidaw has refuted these allegations. An official who chairs Bangladesh’s Human Rights Commission blamed Myanmar for allowing atrocities in Rakhine, but he did not say whether his agency would investigate claims that Rohingya women had been raped. “Whatever happened with Rohingya, Myanmar is solely responsible for all those incidents. Rohingya who entered into Bangladesh, if they were in Myanmar, then they would have died,” Kazi Reazul Haq, chairman of the autonomous government-appointed commission, told BenarNews. At least 65,000 Rohingya have crossed the border into the Cox’s Bazar district of southeastern Bangladesh since the Myanmar military launched a crackdown in Rakhine following the killings of nine policemen by suspected militants, according to U.N. figures. The new Rohingya arrivals add to a refugee population in Cox’s Bazar that totals at least 300,000, according to Bangladeshi government estimates. “The international community should come forward to solve this issue,” Haq added, saying it should put pressure on Myanmar to acknowledge the rights of Rohingya to citizenship in their home country. Delegates from 57 member-nations of the Muslim world’s largest inter-governmental body, the Organization of Islamic Cooperation (OIC) last week held a special meeting in Kuala Lumpur, where they called on predominantly Buddhist Myanmar to end the violence against the Rohingya in Rakhine and hold perpetrators of alleged human rights abuses accountable. Shahriar Alam, Bangladesh’s state minister for Foreign Affairs, headed his country’s delegation at the extraordinary meeting of the OIC’s Council of Foreign Ministers. The OIC meeting followed a series of bilateral talks in Dhaka between Bangladesh and Myanmar officials earlier this month, in which both sides agreed to hold further discussions about the fate of the 65,000 newly arrived Rohingya refugees. Bangladesh has asked that Myanmar take them back. Meanwhile, representatives of the Dhaka office of the International Organization for Migration (IOM), an international humanitarian body that runs camps for unregistered Rohingya refugees in Cox’s Bazar, did not respond to questions sent by BenarNews via email on Monday.